The drones technology aircrafts are operated all over the world for various purposes. Different recruitment companies have included them in their business after seeing their success. These companies are paying one hundred thousand dollars to the pilots flying drones and looking for more such pilots for employment. The recruitment companies are looking for the pilots in advance as their demand is expected to rise. Some of the drone flying pilots have a good grasp of the technique of operating the unmanned machines. They are asking starting wages of $ 5000 per month. At the moment, they get paid $ 50 an hour aggregating to one hundred thousand dollars a year. Al Palmer, Director of the Association For Unmanned Vehicle System and Unmanned Aircraft System, USA says that in coming ten years one hundred thousand drone pilots’ jobs will be in the offing. Facebook is getting down to expand its team to operate the drones. Similarly, Amazon is about to start its supply system through drones. Google in conjunction with Titan Aerospace is getting ready to operate solar-powered drones. 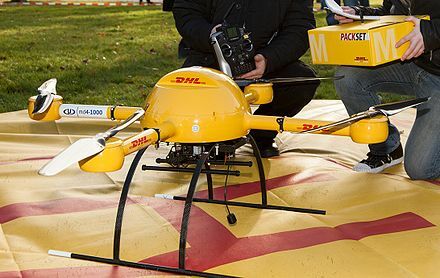 In December 2013, the DHL parcel service subsidiary of Deutsche Post AG tested a “microdrones md4-1000” for delivery of medicine. Google is way ahead of others and has bought over Titan Aerospace. It has applied to the Federal Communications Commission (FCC) for testing the drones, keeping the unmanned satellites in remote areas for proving internet service for areas like New Mexico. Google has requested FCC to keep the test details secretive as the system developed will help in tracking the oil spill or damage to the environment such as deforestation for farming or mining. The unmanned flights are the talk of the Google Offices these days. The Company is also working hard on drone based delivery systems. The possibility of solar-powered drones is remaining in the air up to five years at time. You see Here for the First Time, Supercar To Run Without Fuel.